Set in the midst of Bangkok's biggest shopping area is the strangely serene temple of Wat Pathum Wanaram. Its a sort of multi-layered temple that only reveals all its sights bit by bit. Just inside the high outer wall of the temple is a large pond and parking area that acts as a buffer between the street and the temple, helping to create the quiet serenity of the temple. Passing through the gates in a second wall brings you into the temple compound proper. The temple buildings are arranged in a row parallel to the street. A small elegant ubosot sits at the eastern end. Behind it is a large white chedi, followed by the very large wiharn. Finally is an ancient Bo tree housed in a courtyard. Behind this main line of buildings is a library. Another wall separates the main temple compound from the monks' quarters. Behind the monks' quarters, and actually separate from the temple, is a sort of park thickly planed with trees. In the middle of this is a large open sided prayer hall dedicated to the memory of the late Princess Mother, who lived near the temple in Sra Pathum Palace. Next to the hall is a paved plaza also densely planted with trees. 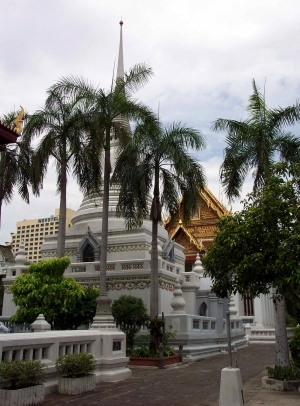 Wat Pathum Wanaram is located in Bangkok's central shopping district, next to the World Trade Center. The easiest way to get there, if you're not staying in the area, is by Skytrain to the Siam Station.